UK: A waste company has been ordered to pay Euro18,968 in fines and costs for illegally handling, storing and depositing wallboard. The case was brought by the Environment Agency. In October 2012 approximately 60t of broken wallboard from Tawmix Timber Products Ltd was found tipped on a site known as Poppy's Field beside an old airfield at Winkleigh, Devon. The material was contaminated with construction and demolition waste. A special permit is needed to treat and store this type of waste. In July 2013 similar wallboard was illegally used to construct a new fence at Tawmix Timber Products' business premises at Unit 2, Winkleigh Airfield. North Devon Magistrates' Court heard that Tawmix Timber Products was permitted to store, sort, separate, screen or crush waste wood at its site in Winkleigh. However, it did not have permission to accept gypsum based construction material such as wallboard, which requires specialist handling, treatment and disposal. The company had received advice and guidance from the Environment Agency on plasterboard and was aware it needed a 'variation' to its permit before it could accept this material. "Wallboard should only be recycled and recovered by specialist companies," said Environment Agency spokesman Sue Smillie. "Tawmix Timber Products did not hold the necessary permits to store, shred and deposit this material. By accepting wallboard on Poppy's Field and depositing wallboard at its main site, the company was in breach of its permit." Tawmix Timber Products Ltd was fined a total of Euro15,167 and ordered to pay Euro3713 costs for two offences under the Environmental Permitting Regulations 2010, including the illegal storage and use of chipped wallboard at Poppy's Field and Unit 2, Winkleigh. The company pleaded guilty to both charges at an earlier hearing. US: Eagle Materials has announced the appointment of Michael Haack as chief operating officer (COO), reporting to Steve Rowley, president and CEO. The COO position is a newly-created one in response to the company's significant growth and continued strategic expansion in construction and energy-related markets. Michael joins Eagle from Halliburton Energy Services, where he enjoyed a 17 year career with successively important operating positions, most recently with the management of Global Operations for Sperry Drilling, a company in the drilling and evaluation division of Halliburton with operations in every major global oil and gas market. He was awarded a Master of Business Administration degree from Rice University and holds a Master of Science degree from Texas A&M University and a Bachelor of Science degree from Purdue University, both in Industrial Engineering. "We are proud to have such a high-calibre and experienced individual as Michael joining the Eagle team," said Rowley. "His placement in this newly created position is timely given our growth progress and strategic aspirations. Haack's experience will be especially valuable given our growth into energy-related markets, most notably in frac-sand and specialty oil well casing cement. This represents a significant step in the expansion of our strong operating leadership team and is aimed at ensuring the long-term continuity of Eagle's enviable performance track record." Honduras: Gypsum wallboard manufacturer Gypcen is seeking to secure its position in Honduras as a pioneer in the export of this product by doubling its production from 2m sheets to 4m. The company competes with large suppliers from the US and Mexico and has invested over US$5m in order to streamline its current processes. In 2015 Gypcen hopes to increase its product portfolio with the introduction of gypsum fertiliser and is currently in talks with a number of clients. It also plans to expend to Brazil and other Caribbean countries. Gypcen currently exports 70% of its volumes to Cuba, El Salvador, Nicaragua, the Dominican Republic, Guatemala, Panama, Costa Rica, Venezuela and Surinam, as well as the US in small quantities. US: US LBM Holdings has acquired Wallboard Supply Company of Londonderry, New Hampshire from the Filion family and its investors. President John Filion will continue to lead the company along with Vice President Ryan Filion and all members of the management team. "Expanding our strong presence and capabilities along the East Coast, Wallboard Supply Company represents a great addition to the US LBM family of companies," said LT Gibson, President and CEO of US LBM. "Our commitment to partner with specialty distributors in the wallboard category ensures US LBM's top place as one of the most diverse providers of building materials in the country." Wallboard Supply Company is a third generation, family-run business that has operated in New England since 1970. Its product line includes gypsum wallboard, metal framing, insulation, lumber and ceilings. The company has its headquarters in Londonderry, New Hampshire with four locations in Braintree in Maryland in Portland, Maine Hermon in Maine and Williston in Vermont. US: Continental Building Products (CBP) has announced its results for the third quarter that ended 30 September 2014. CBP's net sales grew by 8.6% year-on-year to US$114m, adjusted earnings before interest, taxes, depreciation and amortisation (EBITDA) rose by 32% year-on-year to US$33.7m and operating income was up from US$0.3m in the same period of 2013 to US$20.2m. Its wallboard sales volumes grew by 3.8% year-on-year to 590Mft2 and sales prices rose by 6.3% year-on-year. "Our focus on operational excellence and maximising our returns from our low cost base was evident in our third quarter results," said Ike Preston, CBP's CEO. "As we finish 2014 and look to the new year, we remain focused on realising the full potential of our business. We are confident that the long-term fundamentals for construction growth remain strong and we remain focused on delivering value to our customers while actively managing our costs and continuing to deploy our capital in a disciplined manner to drive shareholder value." 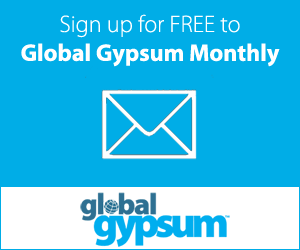 Bulgaria: Bulgarian gypsum producer Gips has announced that its consolidated loss widened by 33% to Euro1.6m in January - September 2014. Consolidated revenues decreased by 5.0% year-on-year to Euro2.45m in the first nine months of 2014. Its operating loss widened to Euro431,239 during the period, from Euro88,500 in 2013. US: Continental Building Products (CBP) has announced that its secondary public offering of 7,000,000 shares of common stock, which was announced earlier this week, will be priced at US$14.75/share. All of the shares are being sold by its largest stockholder, an affiliate of Lone Star Funds. The underwriters have a 30-day option to purchase up to an additional 1,050,000 shares of common stock from the selling stockholder. The offering is expected to close on 25 November 2014. US: Continental Building Products (CBP) has announced the launch of a secondary public offering of 7,000,000 shares of common stock to be offered by the company's largest stockholder, an affiliate of Lone Star Funds. The underwriters will have a 30-day option from the date of the offering to purchase up to an additional 1,050,000 shares of common stock from the selling stockholder. CBP will not receive any proceeds from the sale of the shares. India: FRBPL, a joint venture of Fertilisers and Chemicals Travancore Limited (FACT) and Rashtriya Chemicals and Fertilisers Limited (RCF), has launched the world's largest load-bearing gypsum wallboard panels, which measure 12m x 3m and 124mm thick. The panels are lightweight and waterproof. According to Ananth Kumar, the Union minister for Chemicals and Fertilisers, the panels could revolutionise India's infrastructure sector. Belarus: According to Volma's chairman of the board of directors, Yuri Goncharov, a contract with Germany's Grenzebach for the supply of modernisation equipment for the Belgips plant in Minsk has been concluded. The plant will be operational by the middle of 2015. Under presidential decree No.34, which was signed on 16 January 2014, Volma was required to invest Euro43m to modernise the Belgips plant by 1 July 2018, including Euro24.7m by 30 June 2016. Within the funding, Volma had to transfer at least Euro2.5m to Belgips. "We will meet the investment project deadline, " Goncharov noted. According to local media, Belgips' business is being threatened by multiple factors. The supply volumes to Russia haven't changed, but the product prices have fallen by 20 - 25%. There's also a negative effect on Belgips' position by the Polish companies that, according to Goncharov, offer their products on the Belarusian market at much cheaper prices than their domestic ones. There are also challenges regarding the procurement of raw materials. In response, Volma plans to improve the quality of products through modernisation of the operating facilities. It will also decrease its prices. However, according to Goncharov, prices cannot get much lower. Volma also plans to improve its raw materials supply chain via imports. Goncharov expects to see Belgips in profit in 2015.